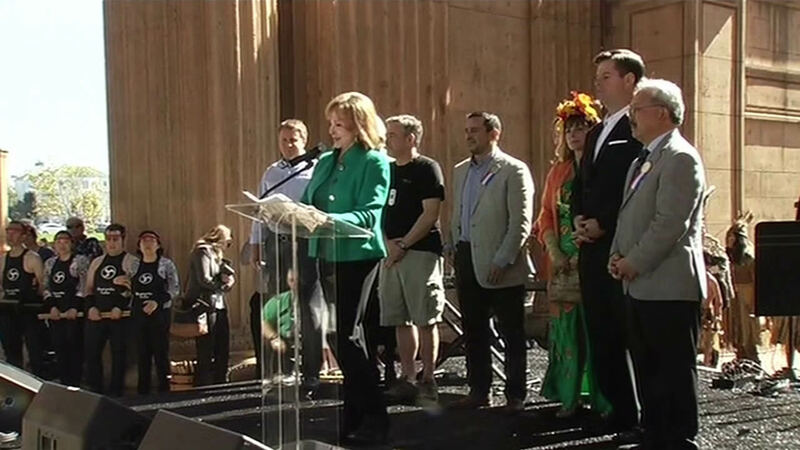 ABC7 News Anchor Cheryl Jennings emcees the reopening of the Palace of Fine Arts in San Francisco on Feb. 21, 2015. SAN FRANCISCO (KGO) -- More than 1,000 people came out for a centennial celebration at the Palace of Fine Arts in San Francisco on Saturday. The Palace of Fine Arts is lit up to celebrate the 100th anniversary of the Panama Pacific International Exposition in San Francisco on Feb. 21, 2015. ABC7 News Anchor Cheryl Jennings emceed the reopening. The event was held among music, art, and displays of appreciation for innovation, just like back in 1915 during the World's Fair. "Henry Ford and the Ford Motor Company had an assembly line right here and they built Model Ts," said Ford's great-great grandson Henry Ford III. "They had 28 mechanics here and they literally set up an assembly line right in front of everybody and it was a pretty cool, pretty cool thing to be able to watch a vehicle from scratch all the way to finished product right in front of their eyes." One of those Model Ts, along with other memorabilia from the 1915 World's Fair, is now on display inside the Palace of Fine Arts. Over the next year, the Palace of Fine Arts will again showcase the latest innovations, this time from the 21st century, capturing the energy and excitement of a city that never stopped shining. ABC7 is the official media sponsor of the Panama Pacific International Exposition 100th anniversary celebration. To find out more about what's happening this weekend, and over the next year head to http://www.ppie100.org/.